It takes time to be funny. It takes time to extract joy from Wriphe. 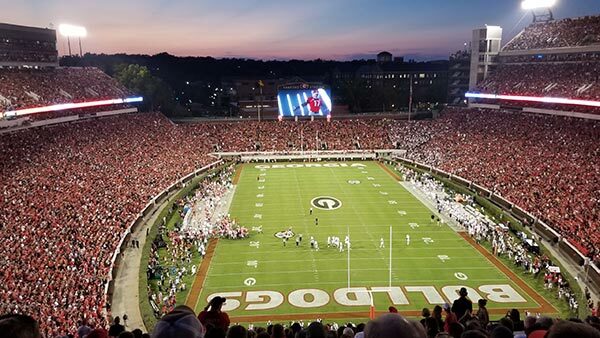 A 7:08 PM kickoff on Saturday meant that I didn't get back home until just before 2 AM Sunday, but it was worth it to see UGA beat down Auburn 27-10. What I will remember most about this game, aside from the drunk girl to my left who couldn't quite grasp the concept of "personal space," is the cold. It may not be the coldest Georgia game I've ever attended (that would be a Tech game almost a decade ago), but it was pretty darn close. According to the television in the student center, it was 38° at the final whistle. As for the football itself, it seems that every year in the annual UGA/Auburn contest, one team out thinks itself. This year, that team was Georgia. UGA tried its best to pretend that it isn't a run-first, second, and third offense in an attempt to beat trick play-happy Auburn head coach Gus Malzhan at his own game. (Blankenship's failed fake field goal springs to mind.) Fortunately, great defense won out. Next year, let's keep it simple, okay, Dawgs? If you had ten gravestones and I took away four, how many would you have? Afterwards, if I gave you four more gravestones, how many would you end up with? 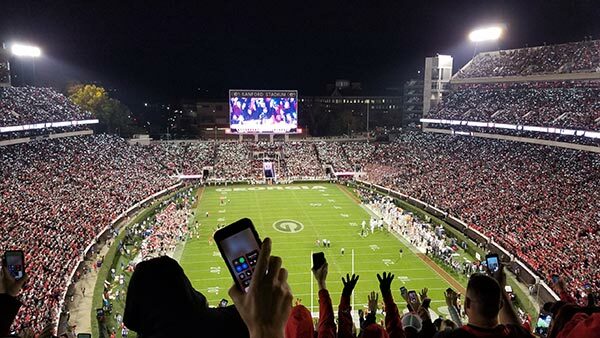 The first night game of the season meant the return of the cell phone lights to Athens! Ok, so they're not really visible in that pic, but trust me, it's cool. 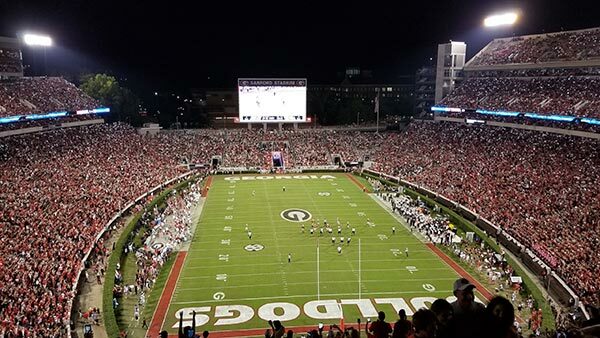 In fact, the only reason Sanford Stadium was that full at the start of the 4th quarter (score at the time: Vanderbilt 6, UGA 38) was because the homecoming crowd was waiting to play with their flashlights. It was worth it. As for the football game itself: Vanderbilt was who we thought they were, and UGA started its season 6-0 for the second straight year — for the first time ever! National title, here we come (he says, tongue only partly in cheek). The next home game isn't until November. I have my fingers crossed that by then, the temperature will finally fall below 80° during a game. While I like my Georgia football team hot, I prefer my Georgia football weather mild. And yes, I believe that I *can* have it all. If you had five pauses that refresh and I took away five, how many would you have? 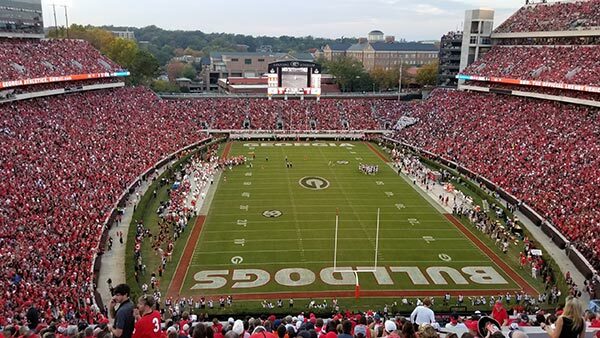 UGA played a football game today in Sanford Stadium. I was not there to watch it. This is one of the few times since I've had season tickets that I simply chose not to go. There were several reasons for that decision. The opponent was Middle Tennessee State, who had played UGA only once. In 2003, the Bulldogs beat the Blue Raiders 29-10. I saw that game. They didn't impress me then. Driving more than four hours to see a "football game" involving a team unlikely to score a single point.... I did that two weeks ago, and had no desire to repeat the experience so soon. In addition, the game, originally scheduled for 7:15PM, was moved to noon to accommodate Hurricane Florence, which as I type this is still terrorizing North Carolina. I was excited about attending a night game, but couldn't get up for sitting hours in the same murderous afternoon heat that drove us away from the Austin Peay game. Besides, to reach Athens by noon, I would have to have set my alarm for 8AM. I'd rather be hit by a hurricane. I'm not complaining about these events. I only enumerate my reasons above for my own elucidation when I look back on this season. I didn't miss the game, as it was televised on ESPN News. (Every game is televised these days, and I had a better view of the action at home than I do in my seats.) Given the same set of circumstances, I'd probably make the same decision. Even a football nut like me has to draw the line somewhere. And for the record, the final score was 49-7. I regret nothing. If you had two dice and I gave you three more, how many would you have? Afterwards, if I gave you eight more dice, how many would you end up with? We welcome the 13th Wriphe.com Batman and Football Month with the UGA home opener! 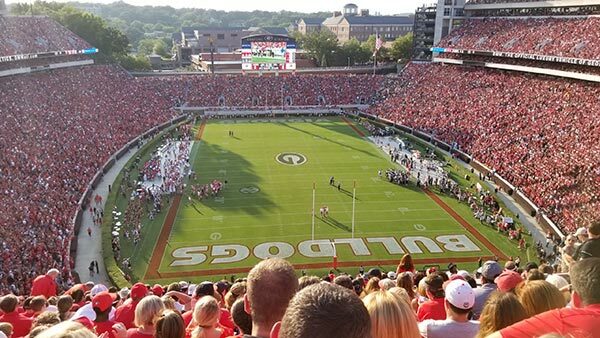 The game was notable for another reason: the debut of the offseason renovation to Sanford Stadium, complete with a new locker room, larger video monitor, and revision to the pregame ritual. Players now enter the field from the west endzone. All that's nice, sure, but I personally found a more notable change to be that the television time-out official now holds up a large digital timer that lets fans know exactly how much longer the time out will last. That's an improvement, but given the weather conditions, it felt like I was looking at an oven timer telling me how much longer until I was done cooking. Most of you reading this know that I spent the entire offseason debating whether I wanted to continue purchasing UGA season tickets. The school has capitalized on its SEC championship and national second-place finish by making a naked cash grab, including increasing ticket prices by 50%. With the season finally underway, I feel I need to get twice the enjoyment from my games to justify the price. Did I do that today? Yeah, I probably did. If nothing else, it was a unique experience I wouldn't have gotten on my couch. If you had three comic books and I gave you nine more, how many would you have? Today's Kentucky/UGA football game was the last home game for outgoing seniors Sony Michel and Nick Chubb, who combined for 238 yards and 5 touchdowns on the way to a 42-13 win. The win doesn't exactly make up for last week's collapse at Auburn, but it does inspire confidence going forward to Georgia Tech and the SEC Championship. Go Dawgs! If you had four lines of code and I gave you four more, how many would you have? Afterwards, if I gave you nine more lines of code, how many would you end up with? If you had two trained killer bees and I gave you four more, how many would you have? Afterwards, if I gave you nine more trained killer bees, how many would you end up with? Whew. A 53-28 Georgia win shouldn't be stressful. It should be easy, a walkover that you can leave before the fourth quarter knowing the second string can put it away. Not so much this one. Four teams ranked inside the top ten lost to unranked opponents this weekend, and during the first half of tonight's game, I was terrified that UGA would be a fifth. Missouri, 1-5 on the season and a 30-point underdog against 4th-ranked, undefeated Georgia, scored on three consecutive drives in the first half to tie the game at 21-21. I admit it; I was watching through my fingers. 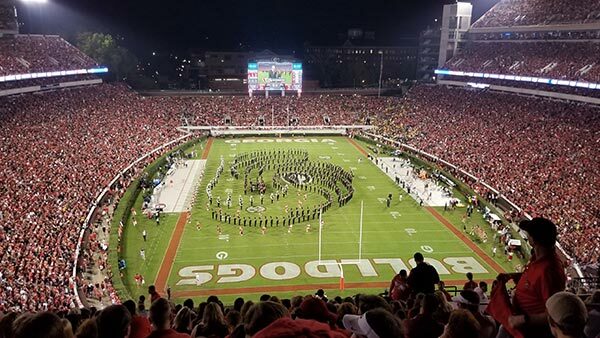 Fortunately, the UGA defense finally applied the brakes, and when the homecoming court took the field at halftime, the score was 21-34. Missouri was never a threat again. I think being undefeated on the season is starting to give me an ulcer. I don't know that I can take many more blowout victories like this. Up next: Florida. Ugh! I might watch with the covers pulled over my head. Yes, but what a lovely way to get an ulcer. If you had three Coca-Colas and I gave you three more, how many would you have? Afterwards, if I gave you five more Coca-Colas, how many would you end up with? I was worried Georgia might have their hands full today. Turns out, not so much. UGA and MSU entered the game undefeated and ranked 11 and 17, respectively. However, early season rankings don't mean much. UGA squeaked by Notre Dame while MSU had walked over LSU. That made it seem that MSU might be tough competition. The final score, 3-31, proved otherwise. It's still early in the season, but if Georgia can play as well as they did today against the rest of their SEC schedule, it could be a pretty good year. If you had two novels written by James Walter Stephens and I gave you three more, how many would you have? Afterwards, if I gave you six more novels written by James Walter Stephens, how many would you end up with? It didn't take long for the 2017 UGA football season to go off the rails. Eight minutes and thirty seconds, to be precise. There between the goalposts you'll see UGA's 2017 season being helped off the field. That's when sophomore starting quarterback Jacob Eason went down with what has been called a "knee sprain" on a late hit out of bounds. As I write this, the true extent of the injury is unknown, but judging by how quickly Eason disappeared from the sideline never to return, this thing is serious. Eason wasn't exactly tearing up the field in the brief time he did play. He completed one of three passes for four yards. His two misses were overthrows of open receivers. Like the rest of the team, he seemed too "tight" to start the game, a recurring problem for the team during Smart's increasingly dissatisfying tenure. Everyone loosened up when true freshman (and the latest in a line of "No, Seriously, He's The Next Great Thing℠" at quarterback) Jake Fromm replaced Eason, and the Bulldogs went on to win in convincing fashion. Chubb and Michel looked game ready, and everyone was happy. Until the fourth quarter, when Bryce Ramsey, in true Bryce Ramsey fashion, threw two interceptions on two consecutive drives on the only two passes he attempted in the game! All 10 of Appalachian State's points came indirectly from Ramsey turnovers. Sigh. I hope next week's opponent — Notre Dame — wasn't watching. Jake Fromm, you better find a way to make a uniform out of bubble wrap. Something tells me you're going to need it. If you had five bottles of beer on the wall and I took away five, how many would you have? Afterwards, if I gave you three more bottles of beer on the wall, how many would you end up with? "In three instances, deputies had to shoot the badly injured deer." Think about that. Imagine a scenario in which a police officer "had to" shoot a deer. What do you see? Does it look something like this? It should. Those collisions weren't accidents. They were yet another offensive in deer's eternal war against humanity. What if, instead of shooting them, the officers had given the "badly injured" deer medical attention and let them go free? How many days do you think would pass before that deer attacked another car? What if next time, it was your wife's car? Or your daughter's? Can you really afford to take that chance? Deer. They'd do it to you. Your seemingly eternal crusade against the Deer Menace never fails to amuse me. If you had four tpyos and I gave you four more, how many would you have? Afterwards, if I gave you eight more tpyos, how many would you end up with?